Tickets: VIP tickets are $35 (SOLD OUT); General Admission tickets are $20, available for purchase by calling 601-678-6733 OR online at http://www.pho3nixrisingentertainment.com/sd-stage-play-tickets/ Tickets will also be available at the door on a first-come-first-served basis. 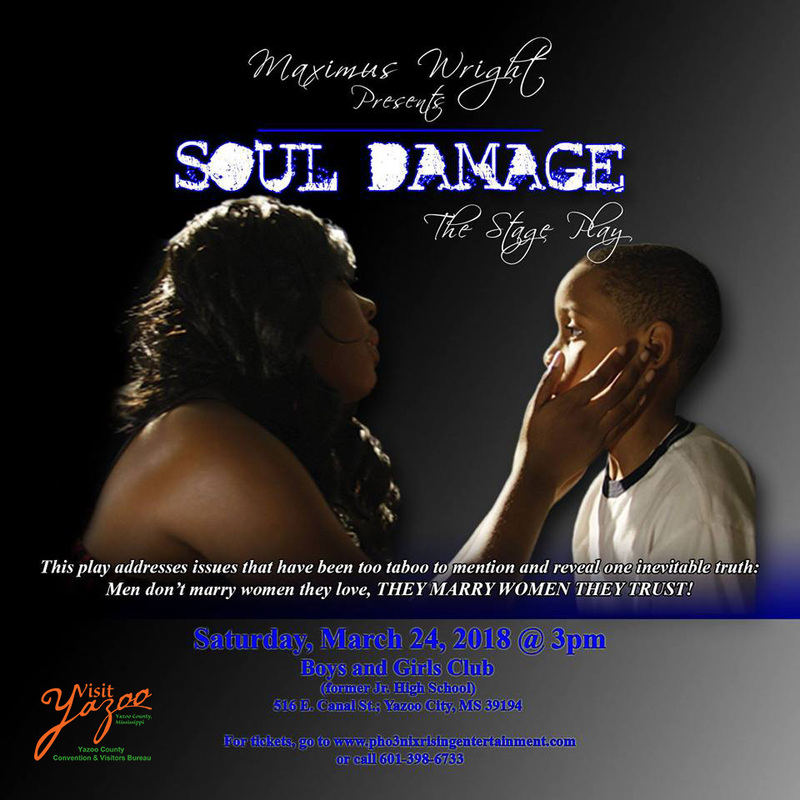 This is the stage play based on the upcoming movie and the book Soul Damage by Maximus Wright. Maximus Wright is a proud Yazoo City, Mississippi native, and father of four, Jaime, Jeremiah, Zacharius, and Jordan. Maximus Wright is a 1997 graduate of Tougaloo College where he majored in Philosophy and Religion with an emphasis in English. Maximus has been mentored by “Mamie Brown’s Baby Boy,” Les Brown, as a motivational speaker and has traveled the country speaking and conducting seminars. In 2013 Maximus started Phoenix Rising Entertainment, a company focused on developing and producing Mississippi talent. Maximus has quickly risen from writing and producing music and directing and writing sketch comedy routines, to producing and directing rising Blues sensation Dexter Allen’s music video, “Coming Home to Mississippi,” featuring Grammy Award-winning Blues icon Bobby Rush. Maximus Wright is dedicated to telling the stories that need to be told and creating a platform for the next generation of Mississippi talent. Maximus is also a 2016 Young, Gifted, and Empowered Young Professional On the Rise award recipient. Soul Damage was published in April 2017 and has been widely reviewed as a “page-turner” which takes the reader on a “roller-coaster ride of emotions.” Production of the movie Soul Damage based on Wright’s book began in November 2017. The stage play by the same name is a first for Wright, and we are so proud that Wright chose his hometown to host this inaugural event. The story follows this wildly attractive yet very mysterious character named “Sirius”. Sirius is perceived as the typical ladies’ man but has a dark past that is ever-present. Sirius is incredibly charismatic and has an almost magical gift with people, but his past prevents him from creating friendships or meaningful relationships. This story addresses some issues that have been too taboo to even mention. Sirius has a very complicated relationship with God and borderline hatred for organized religion. As a child, he and his mother were thrown out of the church after it came to light his mother was having an affair with the pastor. The result of this leads to a life filled with drugs, prostitution, molestation, and violence. He is envied by the character “Gary” and obsessed by the character “Cynthia”, both are his co-workers. They make it their mission to find out who he really is.